Reviewing London After Midnight is in some ways, a very sad affair. London After Midnight is a lost film, the last known copy having burned in a fire in 1967. 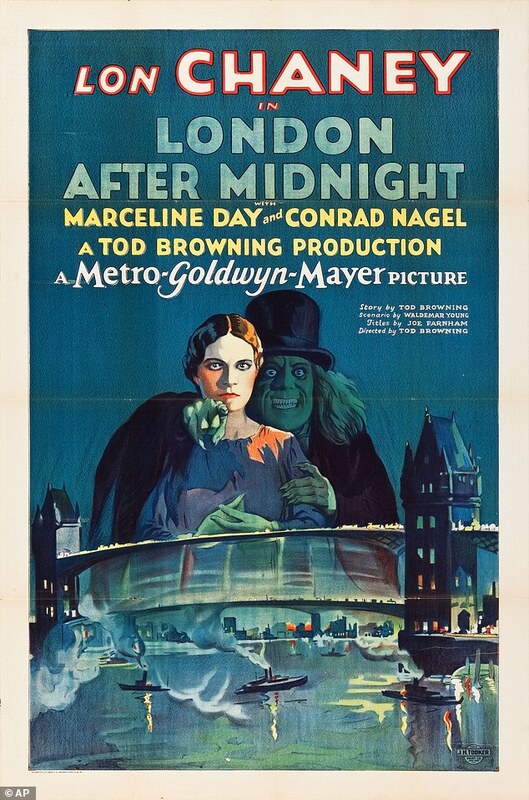 In fact, so much of London After Midnight is lost that as of now, not only is there no known copy of the film in existence, there is only one known POSTER for the film known to exist, having sold at auction for a record $478,000 (the highest price paid for a poster as of today). And no, I wasn't the winning bidder, sorry. We do have, however, a reconstruction of London After Midnight created by Turner Classic Movies from still photos of the film which has been released on DVD. Until a copy can be found (which is theoretically possible), this reconstructed version is as close as we may ever come to seeing what the film actually looked like. Judging the reconstruction, London After Midnight isn't a bad picture, certainly elevated by Lon Chaney's dual performance. However, as an overall story is a bit second-rate, even bizarre. Wealthy Londoner Roger Balfour is found dead. Inspector Burke (Chaney) rules it a suicide, complete with note. However, he isn't convinced, and neither is Sir Roger's neighbor, Sir James Hamlin (Henry Walthall) is not convinced his neighbor did himself in. Five years pass, and now new mysterious things are going on. A sinister-looking being, along with a shadowy female, are now leasing the Balfour estate. Could they be vampires? Sir James isn't sure, so he calls in Inspector Burke again to find out who and/or what they are. Sir James has been the guardian of Lucille (Marceline Day), Roger's daughter. Also living with him is his nephew, Arthur Hibbs (Conrad Nagel). Lucy and Arthur have fallen in love, but Burke suspects Arthur may be the trigger man in Roger's death. These beings frighten the servants, but Burke appears to set up a trap to find not just who these new beings are, but what actually happened to Roger Balfour. We get a few twists and turns to unmask the real criminals, and find out the truth of what goes on in London After Midnight. 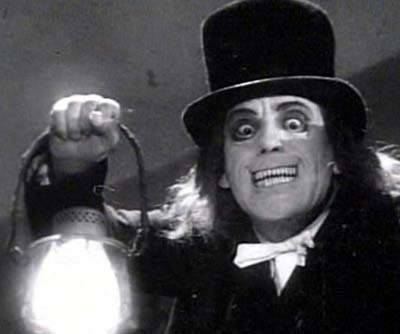 In terms of Chaney's legendary make-up work, London After Midnight is another highpoint in his career. It is appropriately creepy, with some of the tricks of the trade being revealed. I understand that because Chaney plays two parts (Inspector Burke and The Man With the Beaver Hat), he shows on-screen how he created the make-up tricks for the film. In the stills, we can see the clips Chaney used to give his eyes that sunken look. Given the stills, I think Chaney gave a pretty good performance in the dual roles, his Inspector Burke a man of authority, wisdom, and wary suspicion. Day had nothing much to do but be very pretty (which she was), and the same can be said for Nagel. Walthall worked well as the duplicitous Sir James, who ends up being the true villain of the film. However, a lot of London After Midnight both as a film and in the reconstruction is a bit muddled. If Sir James managed to get away with things, why would he recall Inspector Burke to investigate? Wouldn't it have been better to ignore the 'vampire' next door (now that's a good title, don't you think)? Further, we really didn't get a sense that the Man in the Beaver Hat was a vampire. It's not a good thing that you have to be told what we should see (even in the still pictures the reconstruction used). Further, a lot of the story seems a bit confusing. We discover at the end that the Bat Girl was really Lunette, the Flying Woman Theater troupe member. What exactly her role in the investigation is confused, as is who/how they got a Roger Balfour impersonator to fool the killers. Also, did we really have to have as part of the Tod Browning-directed/written film the idea that 'the butler did it'? There's an element of hypnotism that helps unmask the killer, but it does seem to take up time with Arthur. Now, it may be because what London After Midnight is as of today is a series of still photographs put together to make up the film, and something may have gotten lost in translation so to speak. However, some things were a little confusing, even in this short version. It would be good if London After Midnight were rediscovered somewhere intact. Again, theoretically possible, but I think it won't happen. I think Chaney elevates the material and he was one of the great silent film actors. His Man With the Beaver Hat has become iconic, a remarkable fate given there are no known surviving prints of the film he originated in. Ultimately, I think London After Midnight is more for people interested in silent films, particularly silent horror or lost films than regular film viewers. Despite its short length in its reconstruction version I found it a bit slow and a bit confusing. I admit to nodding off from time to time. Still, bless Turner Classic Movies for giving us a reconstruction of London After Midnight, an interesting, and sadly lost, film. Here's to having the vampire rise again.